Another challenge for the team was achieving consistent audio coverage across the 25-metre wide span of bleacher seating without resorting to having a large number of point source boxes on each truss. 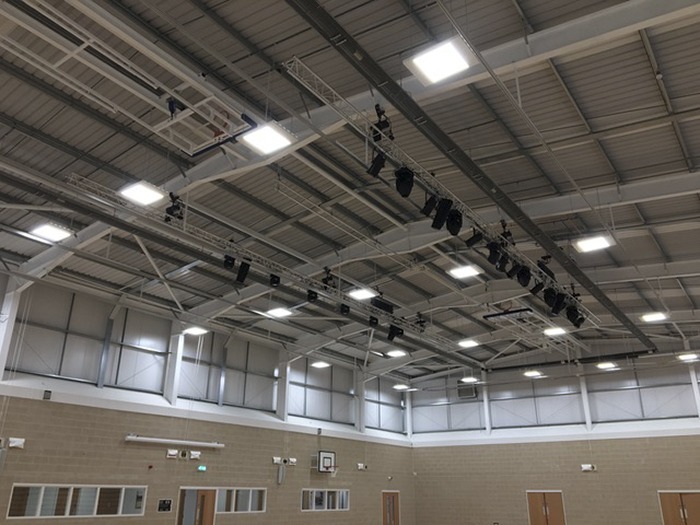 Due to their wide dispersion and selectable vertical coverage, three pairs of JBL CBT 70J-1s were specified, one pair on each lighting truss and one pair installed on the front wall for use during assemblies. Their controllable directivity minimises the amount of sound being fired at the hard surfaces in the hall. In addition a pair of JBL PRX 18” subwoofers were incorporated to allow reproduction of the lower sub-bass frequencies, which can be rolled out and plugged in as required.